Think about your motives for selling. Get a free, independent report from Sold.com. Learn more by visiting Sold.com. When it comes to selling your house, there’s no magic formula to follow; different home sellers go about it in myriad ways, using varied resources. There are, however, some basic steps you can follow to guide you along the process—ensuring you’re doing all the right things to get your home sold expediently, and for top dollar. Here are five especially important steps for anyone looking to sell their home. Think about why you’re selling. Different sellers are trying to accomplish diverse things—and your real estate goals will determine the next steps you take. For example, do you really need to get your listing sold ASAP? Do you have plenty of time to wait for a high-dollar offer? Are you looking for convenience and ease in the sale process? Think about why you’re selling before you do anything else, and be clear with yourself about your goals and expectations. Get a report from Sold.com. Once you clarify your goals, you’re ready to answer the questions at Sold.com, where you will then get a free seller’s report. 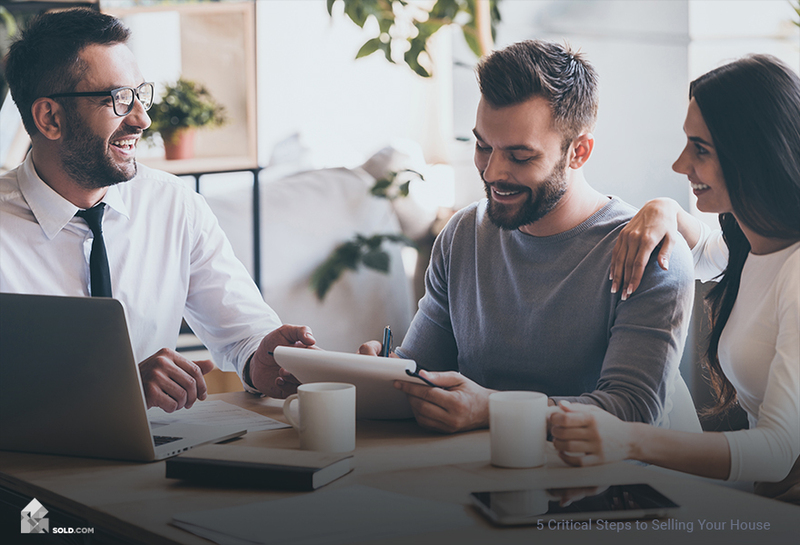 This report will provide you with some unbiased, independent recommendations about how best to meet your home selling goals—for example, by going with a full-service real estate agent, an i-buyer, a flat-fee agent, etc. Your Sold.com report is a valuable tool for making a truly informed decision! Do you have to fix every little thing that’s wrong with your house? Not necessarily—but it is important to put your best foot forward with potential buyers, which means attending to key issues in the most important parts of your home. Definitely make sure the kitchen and bathrooms are in good working order. And, if there are any highly visible issues you can fix with a little DIY magic, try to do so. No house is perfect, but you can at least make yours look nice. Speaking of putting your best foot forward, make sure you spend some time staging—making each room look as appealing and as spacious as possible. Get rid of clutter, moving stray items to storage if possible. Also make sure you keep your house clean while you’re doing showings! One of the most critical aspects of selling your home is pricing it correctly—which means taking a look at how much comparable homes in your neighborhood sell for. This is where a data-backed approach is handy, so look again at that Sold.com report! Again, one of the most important home selling tips we can offer is to reflect on your goals and get a report that will help you meet them. That’s what Sold.com is all about! If you’re thinking about selling your house, we invite you to get your free report today. Take the first step by filling out our questions at Sold.com!